Welcome to this learning platform where we shall learn about nouns. 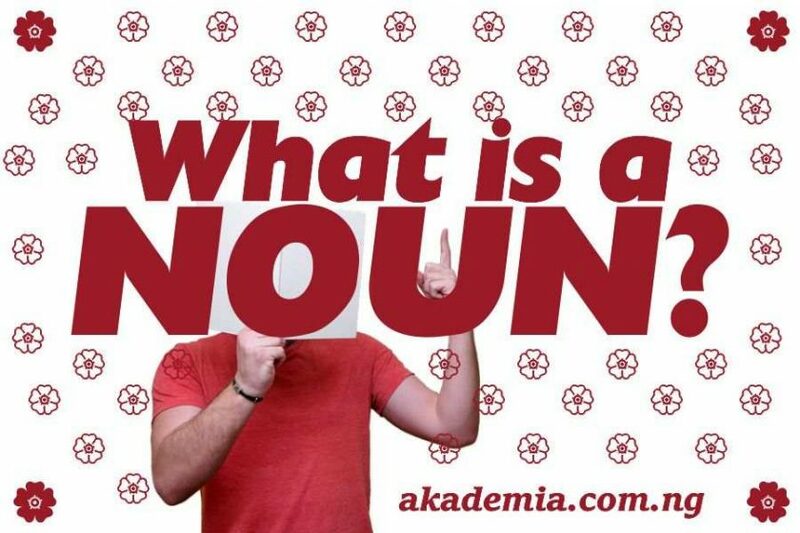 What is a noun, you may ask? Well, there are various ways in which people construe nouns. But let us see some descriptions. In a layman’s term, a noun is generally a name, a content word that is used to refer to anything; a name tag or a label by which something is known; that is, a signifying word. The definition above virtually describes what a noun is; but you need to know in details, for proper understanding, other ways by which a noun can be easily identified. A noun belongs to the grammatical category of words commonly referred to as Parts of Speech or Word Classes. A noun has been generally defined as the name of persons, places, animals or things. You must have used this definition at one time or the other. It could even be the only definition of a noun you know. Never bother, this is very true but there are numerous words that do not belong to any of these categories and they are still classified as nouns. Therefore, the definition of noun as the name of any person, place, animal or thing does not completely capture what a noun is. Whatever you can think of that has a name is a noun. It is a content word that can be used to refer to anything: a person, a place, a thing, an animal, a concept, a quality, an idea, a feeling, a doctrine, a theory, an ideology, a state, etc. It can be a name tag for places, natural occurrences or disasters, persons, institutions, organisations, rivers, mountains, lakes, islands, continents, countries, states, districts, wards, areas, villages, cities, towns, hamlets, settlements, communities, oceans, seas, books, etc. or a label by which something is known; that is, a noun could be seen as what signifies anything – a signifier. A’, ‘AN’ or ‘THE’: This is another way to identify what a noun is. Just insert the article ‘a’ before it if it begins with a consonant and ‘an’ if it begins with a vowel. This is usually applicable to count nouns. Some words are nouns, but it is only the article ‘the’ that can precede them, especially non-count nouns. Once you do this and it makes sense, then what you have is a noun. The rich people also complain. The great Alexander conquered then whole empire. (‘Great’ as used here is a noun). Form and function are important concepts in identifying a noun. The tall man is very kind to his dear wife. (‘The tall man’), though a noun phrase, is the subject of the sentence. Subjects of sentences may not necessarily be made up of one word; they could comprise strings of words, but no matter the number of words they contain, they serve as the subject of the sentence. It will be good at this point to mention the types of objects that a noun can be. First, there is the Direct object and the Indirect object. The man bought his wife a car. The architect designed his mother a detached duplex. One way to differentiate between these two forms of objects is to ask the question ‘what was done?’ and ‘for whom was it done?’ a direct object answers the first question while the indirect object answers the second question. ‘a car’, in example (a) is what was bought (direct object); ‘his wife’ is the recipient of what was bought (indirect object). In example (b), ‘a bus’ is what was bought (direct object); ‘the students’ is for whom it was bought (indirect object). In example (c), it is ‘a detached duplex’ that was designed (direct object) while ‘his mother’ is for whom the duplex was deigned (indirect object). Note that in a sentence where the transitive verb has both direct and indirect objects, the indirect object comes directly after the transitive verb. The man bought a car for his wife. The architect designed a detached duplex for his mother. Sola is a trader (‘a trader’, a noun phrase, is the complement of the subject). The boy became the villain nobody could ever believe (‘the villain nobody could ever believe’, a noun clause, is the complement of the subject ‘the boy’. Note: Don’t forget that we did mention earlier that the subject of a sentence may not necessarily be made up of one word; it could be a string of words. But that no matter the number of words a subject contains, it still serves as the subject of the sentence. This is also applicable to a noun serving as the complement of the subject; it could consist of strings of words. You can call the man Samson. (The noun ‘Samson’ functions as the complement of the object ‘the man’). Nigerians elected Buhari the president. (The noun phrase ‘the president’ serves as the complement of the object ‘Buhari’). You may wish to give the girl whatever she deserves. (The noun clause ‘whatever she deserves’ functions as the complement of the object ‘the girl’). They complained about the roads. (‘the roads’ is a noun phrase which functions as the complement of the preposition ‘about’). The Music Director did not insist on who should lead the song. (The preposition ‘on’ has the noun clause ‘who should lead the song’ as its complement). Having followed our discussion on the various ways by which one can identify a noun, let us now take a look at the different types of nouns that exist. There are various types of noun which include: Proper, Common, Count, Non-Count, Concrete/Material, Abstract, Collective, Verbal, Possessive, etc. I have provided detailed explanations on each of these types of noun in another post. (See Types of Nouns). You can also check out nouns and their plural forms.